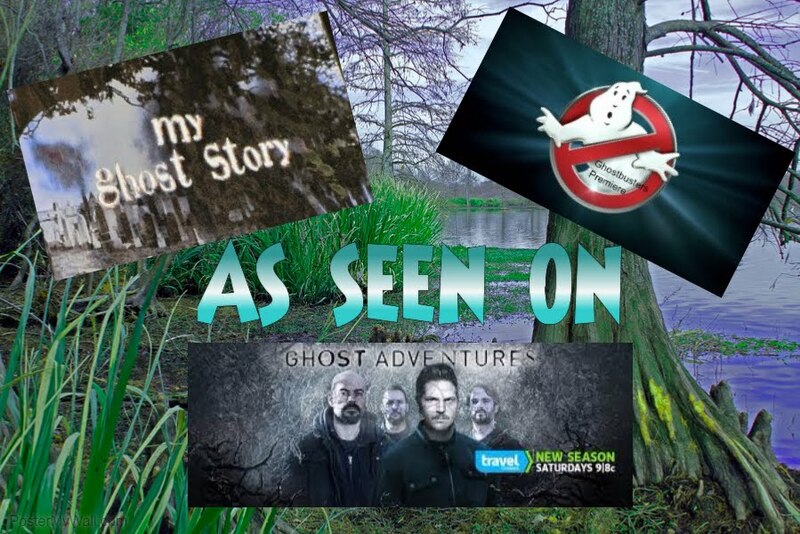 Becky Vickers(BECKS) - Everyday Ghost Hunters/Goatman's Bridge Ghost Tours: OUIJA BOARDS....SHOULDN'T YOU OR SHOULD YOU??? OUIJA BOARDS....SHOULDN'T YOU OR SHOULD YOU??? So, we all remember when we were growing up having friends over and trying to think of something to do. Usually, you were just sitting around and without fail.......someone would say...."I know....lets have a Séance!!!" And that's it!!! Everyone jumps up and says "YES....get the Ouija Board!!!" You run to the table, and everyone grabs a chair and picks their spot, and you put the Ouija Board in the middle. "Everyone ready?" "YES... YES.....turn the lights off". You have the candles lite and everyone puts their fingertips on the little pointer....."Ok.....who do we want to contact?" Everyone is talking at the same time and names of different people are thrown out ........ names of loved ones, friends, actors, actresses, famous people you name it....everyone is talking at once trying to come up with someone COOL to talk to. So, finally you decide.................. the spirit you are going to connect is............is......... ELVIS!!!!!! LOL..... Don't laugh...you know you did it at one time or another......Yeah that's who it's going to be!!!! So everyone gets really, really quite.......and with their fingertips lightly placed on the pointer...you start asking questions.....ELVIS....are you here??? And slowly the pointer starts moving... first....to the letter Y....then to the letter E...and last...to the letter S! By now, everyone is accusing everyone else of purposely moving the pointer. Even on the first question.....everyone is adamantly denying they are NOT moving the pointer!!! Now, the really smart kids....."THERE OUT"!!! DONE!!! But not the rest.....they just start asking more and more questions as the pointer moves around to the different letters to spell out the answer to their question. With Halloween coming up, I hear..."Ouija Board" coming up more and more often. 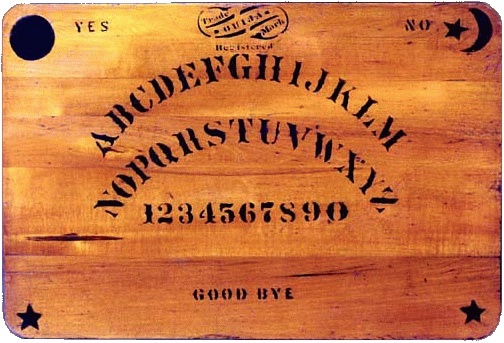 A Ouija Board, by definition is a piece of wood bearing the letters of the alphabet that is used as a tool to make contact with the spirit world. Sitters place their fingers lightly on the pointer for by which the spirits can spell out messages on the board. This is the most controversial methods of spirit communication because in untrained hands it is believed to attract evil spirits. Critics say that not only is the Ouija Board dangerous because it can attract evil entities but also because users have know control over repressed material that might be released during a session. The Ouija Board which is now marketed as "a game" by Parker Brothers, has been so successful as "a game" that it has sold more than the common staple game.....Monopoly. Let me see how to say this so that you understand where I stand on this.............DON'T DO IT!!!!!!!! I feel you have to REALLY KNOW your stuff before you attempt to use a Ouija Board....I am just NOT comfortable using it. In my OWN little ghost hunters mind.......you could possibly call up an evil spirit that COULD..... not saying it WOULD.....just saying it COULD attach itself to you because your touching the actual "opening to the portal" with your fingertips and who knows.....they may come right through and right through your fingertips and enter your body or attach itself. I know...I know....not everyone thinks like me....but this is my opinion. And I know it sounds a little crazy...but......you know........I AM a GHOST HUNTER.......so CRAZY I'm used to!!!! LOL So, if you DO decide you are going to use a Ouija Board.....please just make me feel better and say a little protection prayer. Just stay safe this Halloween....OK. 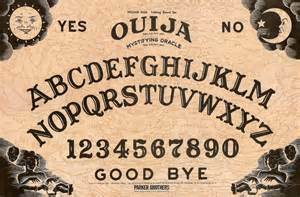 If you HAVE used a Ouija Board I would LOVE to hear about your experience....if NOT....what is your opinion on this...Should you or Shouldn't you??????? To say Ouija and talking boards are only for "bad spirits" is a smack in the face to the pioneers of ghost hunting who didn't have EVP machines, Thermal imaging and video cameras 100 years ago. 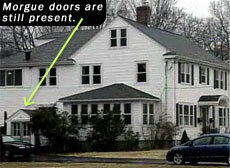 Why would a bad spirit know how to use an ouija but not an EVP machine or take over a "medium". Bias, bias views when it comes to talking boards. Well I don't believe I said Ouija Boards are ONLY for "bad spirits". But do I think you run the risk of having a "bad spirit" come through....yes I do. And as far as I know, "ghost hunters" did not use Ouija Boards 100 of years ago. They used lots of different methods but I don't believe that a Board was one of their Base tools. And I apologize if I offended you with my views, that was not my intent. But for ME....it is something I would not want to chance.